Upon your arrival at the Kathmandu airport, our tour representative will meet you and assist you in smooth transfer to the hotel. Later, check-in at the hotel pre-decided for your stay. In the evening, take a leisurely stroll to explore the nearby areas of Kathmandu. Later, return back to the hotel for a lavish dinner and night stay. Early morning, after breakfast, proceed on an optional trip to visit the Himalayan Mountain or you may take a tour to explore the Bodnath Stupa. Visit the famous Swayambhunath Temple, perched atop of a hill. Here you will also attend the prayer ceremonies of Pashupatinath Temple along with the Buddha Nikanth Darshan. Following the prayer ceremony, you can choose to visit the neo-classical historic garden, situated in the middle of the Kathmandu City in Nepal. Later, set out to visit the Kumari Chowk. The town is famous for being the home to the virgin girl, worshipped in the form of Goddess Durga. In the evening, return back to the hotel for dinner and night stay. Early morning, post breakfast, leave by road to arrive at the China Border seated in the reserved tourist coach. Upon arrival at the China border, meet out representative who’ll assist you in completing custom facilities. Complete the custom facilities and check-in at the territory Tibet, an autonomous part of China. Later, leave by road to small Tibetan town by Land Cruiser. Stay overnight at the guest house. On the day, the day is free to relax and acclimatize to the high altitude conditions. In the evening, take a leisurely walk to explore the place for its mesmerizing and alluring beauty. Later, return back to the guesthouse for a sumptuous dinner and overnight stay. Post breakfast in the morning, get ready to start with the first longest driving day of the trip. While driving through the winding roads drive past beautiful lakes, Peku-Tso and Labug-La. In the afternoon, you will cross the Brahmaputra River before reaching Dongba. Dinner and overnight stay at the guest house. After breakfast in the morning, take a road trip from Dongba to Mansarovar. Following a seven hour long drive, reach Mansarovar. Here you will attend the Pooja and Havan at the holy Mansarovar Lake. On your first day at Mansarovar Lake, stay in the well equipped tents located on the banks of the lake. Dinner will be served at the tents. On the day of your Kailash Mansarovar Yatra, wake up in the morning to take the ritual bath in the holy Mansarovar Lake. Later, you may conduct Pooja, Havan and other spiritual activities as per your tradition. 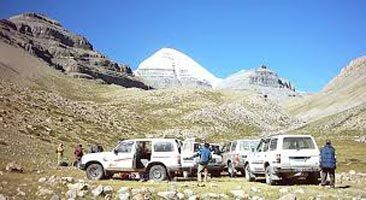 Later, enjoy a Parikrama of Mansarovar Lake via Land Cruiser. The rest of the day is spent attending other spiritual activities. Later in the day, leave by road for Darchen and enjoy overnight stay there. The day is the first day of Kailash Parikrama. Post breakfast, you will start your journey. Today the travelers will be required to walk for about 6 to7 hours continuously. After driving to Yumdwari, our journey starts. Overnight stay at Diraphuk in tent. 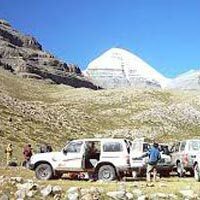 On the day of the Kailash Mansarovar Yatra, you will be required to cross Dolma-La Pass. The erratic weather conditions in Doma-La Pass and at any time snowstorm can fall. Therefore, it is advisable to start your journey as early as possible. On the way, you can have Darshan at Gaurikund but it is very difficult to go and touch. Stay overnight in tent at Zhulthulphuk. In the morning, after enjoying the Darshan of the east face of Kailash, enjoy a trek to Kuber Kund, the famous Lake. Later, enjoy trekking trip to Zhulthul Park. Upon reaching Zhulthul park, trek down to reach Darchen and drive towards Mansarovar. Take a dip in the spiritual water from the Mansarovar Lake which is kept in every home and used in various religious practices. In the latter half of the day, trek back to Kathmandu following the same route. Upon arrival in Paryang, enter into our guesthouse for dinner and overnight stay. In the morning, after breakfast, take a road trip to reach Nyalam. This will be your last day in the Tibet part. Upon arrival in Nyalam, stay at one of our listed accommodation options. Dinner and overnight stay is scheduled at the guesthouse. Post breakfast in the morning; move out to fulfill the custom formalities. After completing the custom formalities, get into the car and drive back to Kathmandu. The journey is a 5 hour long drive to reach Kathmandu. Upon arrival in Kathmandu, check in at the hotel for dinner and overnight stay. In the morning, after breakfast, check out of the hotel and drive towards airport to board flight for your onward journey. Here you will have the option to extend your stay to enjoy a Himalayan mountain escape, or move out to the Muktinath tour. Tourists can also take up the Manakamana road trip.